Ever wonder what that red and white-headed, lettuce-like vegetable is in the produce section? 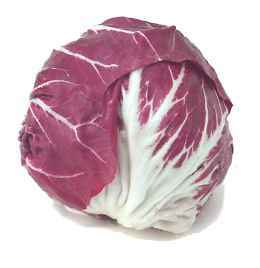 It’s not red cabbage; it’s in the chicory family so it’s technically not a lettuce either. It’s called radicchio and it’s delicious! It does have a bitter taste but if it’s balanced in a salad with milder tasting things it won’t be overpowering. Give it a try! Mix all ingredients in a salad bowl except oil. Add oil and mix well. If you used grated zucchini instead of zucchini relish, add 1 Tbsp. fresh lemon juice and salt to taste. Serves 4. Traditionally pesto is served with pasta or bread. If you are avoiding wheat or flour products, pesto can still be very much enjoyed. Pesto is a condiment of sorts made with fresh leaves of the kitchen herb, sweet basil. There are various recipes out there–this one is simple and uses sunflower seeds instead of pine nuts but you could use pine nuts or almonds or walnuts if you prefer. Also, no olive oil or butter are used in the pesto so that the mixture remains somewhat crumbly and mixes easily with vegetables or sprinkles readily on top of vegetables or fish or eggs or millet grits. The butter or olive oil–you can also use ghee– can be added separately as you will see in this recipe. You will need a food processor for this recipe. If you want to add some other vegetables to the green beans, 1/2 cup chopped sweet onion and a small zucchini cut in cubes work great. I’ve also added any or all of the following: a chopped tomato, 1/2 cup chopped sweet red pepper, 1/4 cup crumbled feta cheese.. Don’t cook any of these though. Add them to the beans after the butter or ghee has been added to the beans and is melted..
optional: 1/3 cup grated pecorino romano cheese (parmesan is ok too). 1 Tsp. nutritional yeast flakes can be substituted for cheese. Process the sunflower seeds or nuts until ground fine. Add the basil leaves and process until the leaves are ground in with the seeds. Add garlic and process again. Add grated cheese or yeast and process until all is thoroughly blended. Steam 3 cups of cut green beans (fresh or frozen) until just tender and still bright green. Place in a serving bowl and immediately add butter, ghee, or olive oil and stir until mixed well. If you are adding any other vegetables as mentioned above, add them now. Add pesto mixture and stir well. Serve warm or cold. This lacto-fermented vegetable recipe appeared in Wise Traditions,, Fall 2011. Lacto-fermented vegetable recipes often are cabbage-based– this one is not and is a refreshing change as well as being easier to make. I made a few changes to the original recipe after experimenting with it. Besides being delicious–especially on salads, hot dogs, egg dishes, and with cheese–it is full of probiotics which are very healing to the digestive system. Unlike other relishes, the ingredients are never cooked thus preserving nutrient levels and enzymes. The fermentation process makes the raw ingredients very easy to digest–be sure not to heat it! It will keep in the refrigerator for weeks. Mix all ingredients except the leaf in a bowl. Let sit 5 minutes. Place the leaf in the bottom of a glass quart-sized or 1/2 gallon-sized mason jar (wide-mouth jar is best so that the weight fits in). Spoon vegetable mix into the jar and be sure to pour all liquid into the jar also. Press the vegetables for 5 minutes or so by pressing down with a spoon to assist with release of liquid from the vegetables; this step is not always necessary as long as there is enough liquid to cover the vegetables in the jar. Be sure to leave at least 2 inches of air space at the top of the jar so that as the veggies ferment and bubble out gases the liquid doesn’t overflow the jar. For the weight that keeps the vegetables submerged in the liquid, use another smaller jar that fits inside the quart mason jar–any size that fits inside the mason jar is ok as long as it is tall enough for easy removal. You can fill the smaller jar with water so that is heavier. Press it down once or twice a day to assist with release of gas bubbles. Put a towel or cheese cloth held in place with a rubberband over the top. Leave at room temperature for 2-3 days. Depending on how warm it is, the fermentation time will vary so taste the mixture every day. Keep refrigerated when you are ready to stop fermentation. If you prefer a crisp texture, refrigerate after 2 days. Also, consider adding the chopped cucumber after the fermentation of the other ingredients and right before you refrigerate so that the cucumbers will be crisp. Lots of options! Just be sure you get lots of fermentation bubbles going (indicating the growth of probiotic bacteria) before you refrigerate.